Bishop, a 40-minute drive south of Mammoth Lakes and 4,000 feet lower in elevation, is truly the heart of the Eastern Sierra. The town has charm and grace, the community is hospitable and friendly, and the landscape is … well … spectacular! Bishop and surrounds have incredible natural beauty, a wonderful climate, and a multitude of outdoor activities in settings that are considered world-class. It’s close to two of the country’s most impressive National Parks – Death Valley to the southeast and Yosemite to the northwest. From here there are places to go and things to do year round that can keep explorers busy and families active on any given day. There are adventures to be had, sights to see, discoveries to be made, challenges to be accomplished, achievements to be reached, and when you need a little down time there’s solitude to be found. Winter days here are frequently sunny with highs often reaching the low 50s. If you’re looking to add some diversity to your winter vacation or winter weekend away that won’t add to your expenses then Bishop has some great options. 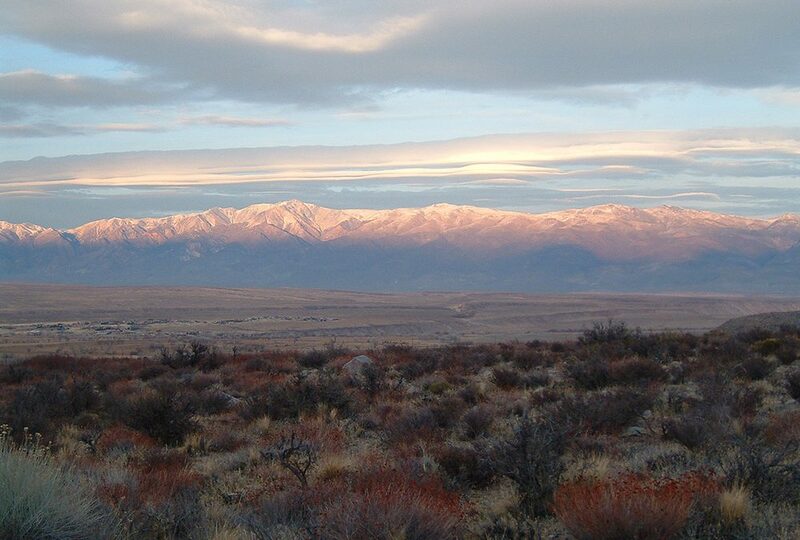 Whether you plan on a spending a couple of days in beautiful Bishop or have just a few hours to spare during your travels along Highway 395 consider doing one or more of these fun activities? There are numerous trails and tracks that offer leisurely family riding or technical, downhill challenges. Routes run alongside creeks, streams, and the Lower Owens River; in and around the Tungsten Hills and Buttermilk Country; in the foothills of the White Mountains; and on mountain crests and down steep sided canyons. Not sure where to start your cycling adventures in Bishop? Try out the Starlite Drive trail for a taste of mountain biking fun in the Eastern Sierra. It’s not too long, but has super features that will get your body warm, your blood pumping and your legs working. Head west out of Bishop along Highway 168 for 7 miles and turn right onto Buttermilk road. Follow this wide, graded dirt road for 1.7 miles to Starlite Drive and turn left. Park in the clearing to your right just off the intersection of Buttermilk Road and Starlite Drive and start your ride with a warm up on the uphill toward Starlite. In .4 miles, just as you crest the rise and see Starlite up to your left, you’ll see the single track veer off to your right. Take it! Follow this undulating trail for 1 mile then turn right at the junction with an obvious dual-track. Now you’re on your way down back to where you started. If you’re an angler you know that California fishing season runs from the last Saturday in April to November 15th, but did you know that fishing on the Lower Owens River is legal all year long? Come down from the cold where the warm sunshine of a Bishop winter afternoon thaws your body and lets you cast your line for a great variety of warm water fish. It’s here that carp, bass, bluegill and catfish (in addition to trout) will test your angling skills and raise your opinion and appreciation of them. Miles of canals, large reservoirs and protected ponds, some offering handicapped-accessible fishing piers, in the Owens Valley are virtually untouched by anglers, and yet hold a promise of exciting winter fishing with fly, lure or bait. January is a great time to get out your snowshoes, backcountry skis, or cross-country skis and make tracks in the high Sierra. A favorite XC ski and snowshoe trail is along South Lake road a mere 25 minutes out of Bishop. Take Highway 168 west out of Bishop for 15 miles to South Lake road, turn left and follow the road to the seasonal road closure just beyond Bishop Creek Lodge. Here the snow will be piled into a berm restricting further vehicle access and the trail begins. Tracks may already be cut depending on recent trail users and when snow last fell, so whatever you find keep cross-country skis in-track and snowshoes off-track. Be prepared for wintery conditions and dress in layers. Let family or friends know that you’ll be out in the mountains and when they should expect you back. A 10-minute drive south of Bishop will get you to Keough’s Ditch hot spring. It is situated just a few hundred yards from the wonderful Keough’s Hot Springs resort, which is not free, but at $10 for adults and $7 for kids for a day pass it’s a treat well worth it. However, if the prospect of a free soak, “au naturel”, appeals to you to take Highway 395 south of Bishop and turn west onto Keough Hot Springs Road. Drive .6 miles toward the resort then turn right onto a dirt track and 500 feet further pull off and park in the clearing to the left. With winter brush dry and sparse the warm pool will be visible surrounded by rocks and low vegetation. Local volunteers keep the pool clean, but its condition varies throughout the year. One note of caution whenever you soak in any natural hot spring is to keep your head above water and don’t let the water get into your mouth, nose or ears. The Eureka Dunes are the tallest sand dunes in California. Situated in the northwest section of Death Valley National Park these dunes cover an area 3 miles long and 1 mile wide and lie in an enclosed basin at 3,000 feet above-sea-level (ASL). A hike to the top of these dunes, also known as the Singing Sand, is not as easy as it looks. Slopes are steep and the sand will give way as you walk atop this loose surface. The singing sound happens when the sand is completely dry and it avalanches down the steepest slope of the highest dune to create a sound like a bass note of a pipe organ. Daytime temperatures can be warm with nighttime temps falling well below freezing. A 2-½ hour drive of about 65 miles from Bishop along a winding mountain pass and through some of the most remote and rugged terrain in the west is reason enough to take this trip. The last 10 miles of the drive is on graded dirt, but can be a little rough due to washboarding. This adventure is definitely an all-day affair and it’s best that you make sure you have enough fuel, food, water and warm clothing for everyone along. Snowfall may close the pass sometimes in winter so make sure to get the latest information on road and weather conditions. To find out more about all these adventures and activities visit the Bishop Visitor Center at 690 North Main Street, Bishop, for up to date information, maps and advice.